Diet and nutrition are essential for good health and the role of vitamins and minerals have been well researched and are now well understood.Many of the complaints that happened years ago can now easily be avoided by making sure we are eating a good diet and taking a supplement if necessary.Rickets is now fairly rare in the UK but still occurs in other countries that struggle to achieve a good nutritional status. Rickets is a condition that mainly affects growing children. It is caused by a deficiency is vitamin D and now experts believe that low calcium may play a role.The biggest cause of vitamin D deficiency that leads to rickets is from malnutrition and although it is most commonly thought of as a childhood problem, can occur in adults occasionally. Initially the symptoms may go unnoticed as beneath the skin and tissues the bones begin to soften and weaken.Very young children and babies that have a vitamin D deficiency may seem quite ‘floppy’ as their muscles do not gain strength and definition.There can be noticeable weakness and lethargy but most of the symptoms cannot be seen unless detected by an X-ray or other similar scanning technique.If rickets is left untreated the results can show as the child ages and can give the appearance of knock-knees or bows. 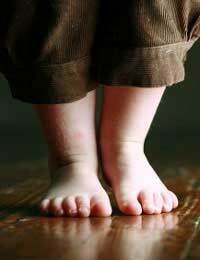 Preventing rickets must begin when we are babies. Making sure we spend some time outside during day light hours even if it is in the winter months will help keep us healthy.The effects of rickets can cause some very noticeable results in later life and may lead to mobility problems and the risk of brittle bones if calcium is low too so parents should try and encourage children to play safely outside when they are able and protect them from harmful rays at the same time. There are many sources of vitamin D and often the most important one is exposure to natural sunlight. This does not mean that we should be exposing ourselves or our children to long periods of the sun as this poses its own risks but a simple walk for ten minutes a day should be enough to give your child a healthy dose of vitamin D.
Food sources that contain vitamin D include cod liver oil and some varieties of fish. These items can be difficult to include in the diet of a young child so exposure to natural sunlight is essential. If you think your child may be at risk of a vitamin D deficiency it is possible to take a supplement to ensure their supply is kept up.People who have darker skin tones may need more sunlight to achieve the same level of vitamin D but again this does not mean we should be exposing our skin to unnecessary harmful sun rays.As calcium is thought to contribute to the development of rickets it is important to make sure this is included in the diet also. Sources of calcium include dairy produce, dark cabbages, hard water and cress. If these are not available a supplement can be taken also. Nutrition and health are a partnership and without essential vitamins and minerals we are putting ourselves at risk of long term damage.We should make sure we find ways of including fresh produce rich in all the required elements into our diet on a daily basis even if we don’t particularly like the food item. Being brave and experimental in the kitchen may help find new ways of using the ingredients we aren’t particularly keen on which will help keep us healthy.